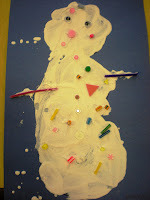 Our snowmen went home this week. Since I had posted the beginning of the project I wanted to let you see the final products. 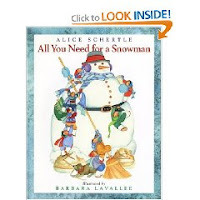 I had read the story, "All You Need for a Snowman," by Alice Schertle, illustrated by Barbara Lavallee. 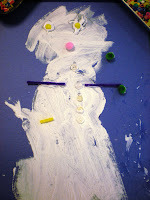 Then we talked about the different things one could add to make a snowman--arms, eyes, nose, hat, etc. 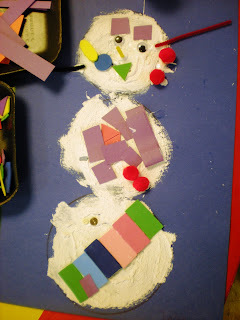 I had raided the closet and found lots of little items that they could use to finish off their snowmen: pom poms, straw pieces, beads, pipe cleaners, etc. I didn't have actual eyes out, but they asked me if they could use googly eyes so I got some out. I then gave them some tacky so that the pieces would stick better. 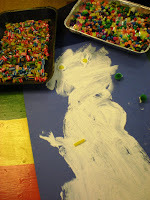 We got lots of great creations that I wanted to let you see. 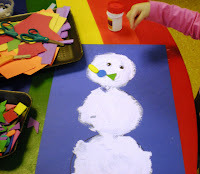 One note: When the children used lots of glue, after the glue dried, the Ivory Snow tended to flake off more easily than in other places. 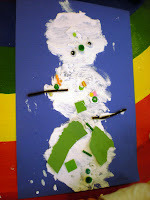 Your snowmen turned out so much better than ours. I let the kids mix their own Ivory Snow mixture, so maybe we got it too thin . . . We'll have to try it again! Those really are some snazzy snowmen! Oh, your snowmen are so cute! 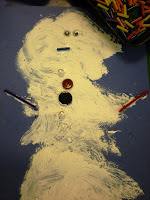 We just made snowpeople in our house, too. I just posted them.